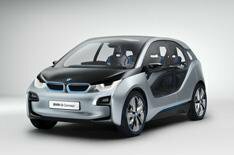 2013 BMW i3 exclusive preview | What Car? Fancy being one of the first people in the world to see the all-new BMW i3 electric city car? Here's your chance. We're giving you the opportunity to have your say on the new BMW i3 just 24 hours after it's unveiled to the world's media and you'll get to see the car at the same central London venue. First seen in concept form at the Frankfurt motor show in 2011, the all-electric i3 and soon-to-follow i8 sports car are promised to shake up the electric car market. BMW reckons 6000 people have already expressed an interest in its 'game changing' i brand. The four-door aluminium and carbonfibre i3 city car is due to go on sale at the end of the year and features a whole host of innovative technology, as well as a futuristic, eye-catching design. Has the BMW i3 got what it takes to get you behind the wheel of an electric car? Will you share BMW's vision of the future of motoring? This is your chance to find out.